This demo surveillance video demonstrates the day and night time infrared capability of the HD-TVI-AD8 surveillance camera. 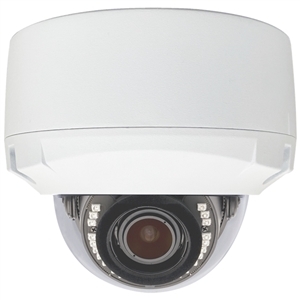 The HD-TVI-AD8 is a weatherproof and vandal resistant high definition dome surveillance camera. This camera is ceiling mounted in this corner of the room. The door that I enter from is 37 feet away from where the camera is installed. This video demonstrates the 1080p HD video that this camera is capable of recording in normal light and zero light conditions using it’s built-in infrared night vision mode. I turn on the lamp so that I can find my way back to this spot when I turn the main lights off. When I turn the lamp off, there is zero light in the room and the camera engages it’s infrared night vision mode. You can see the the infrared LEDs that are built into this camera do a great job of illuminating the entire space. This room is 29 feet wide by 28 feet deep. I use the light on my iPhone so that I can see again. When I turn the light back on, the camera turns off it’s infrared and captures 1080p video in color again. The HD-TVI-AD8 is a 1080p high definition CCTV camera. 1080p is equivalent to 2 megapixel resolution. HD-TVI cameras are hard wired to a surveillance DVR using the same type of coax cable as traditional CCTV cameras systems which makes it easy to upgrade legacy analog systems to high definition analog. The infrared night vision of this camera is effective up to 80 feet. The 2.8 to 12mm adjustable lens allows professional and DIY installer to easily adjust the angle of view to be very wide or narrow and zoomed in. This camera is IP68 weatherproof rated which means that it can stand up to the harsh outdoor climates. The dome enclosure is also vandal resistant which makes it also an excellent choice for indoor installation in vandal prone areas. An optional wall mount bracket is available if you prefer not to directly mount this dome to a wall or ceiling. CCTV Camera Pros supplies this security camera for home, business and government surveillance system installations. Click here to learn more about the HD-TVI-AD8 Dome HD-TVI Surveillance Camera used in this video. HD-TVI cameras are available in many different models including indoor, outdoor, dome, bullet, box, and even hidden spy cameras. Click here for to see the latest models available. iDVR-PRO surveillance DVRs support HD-TVI cameras in 720P and 1080p resolution. In addition, iDVR-PRO DVRs are hybrid and can also support analog CCTV cameras and HD-AHD cameras (720p and 1080p). Learn more about iDVR-PRO below.